In a renewed focus on high profile online content and experiential events, Johnnie Walker has brought to life the “unique character” of four of it’s whisky labels via a new global ad campaign. Dubbed the “Character”, the campaign, developed by Anomaly, focuses on the individual character in the craftsmanship and blending excellence behind four Johnnie Walker Scotch whiskies through a series of exquisite imagery, including Blue Label, Gold Label, Black Label, and Double Black. 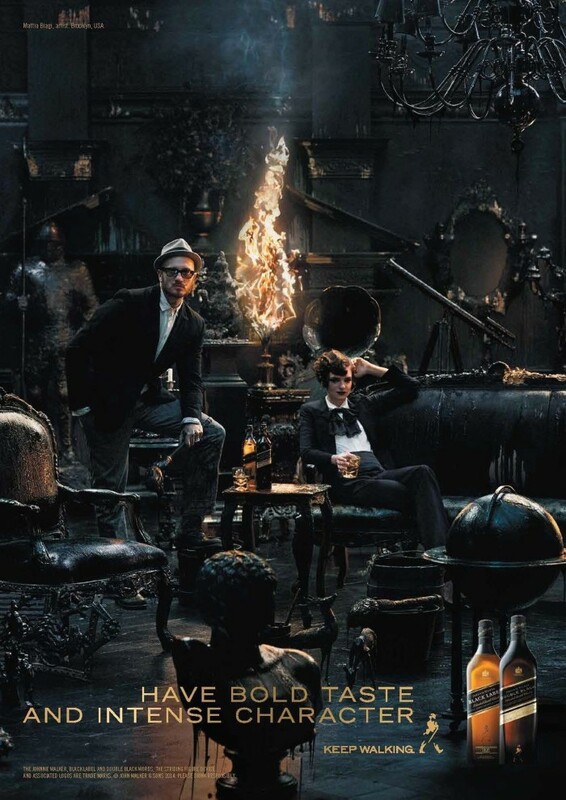 In creating the campaign, the Scotch whisky brand has worked with a range of art pioneers to craft a series of images that have been influenced both by the character of the blends and the expertise of the personalities behind the images, producing powerful visual metaphors for the character of each whisky. Each commercial takes its inspiration directly from the characters of the whisky at its core. 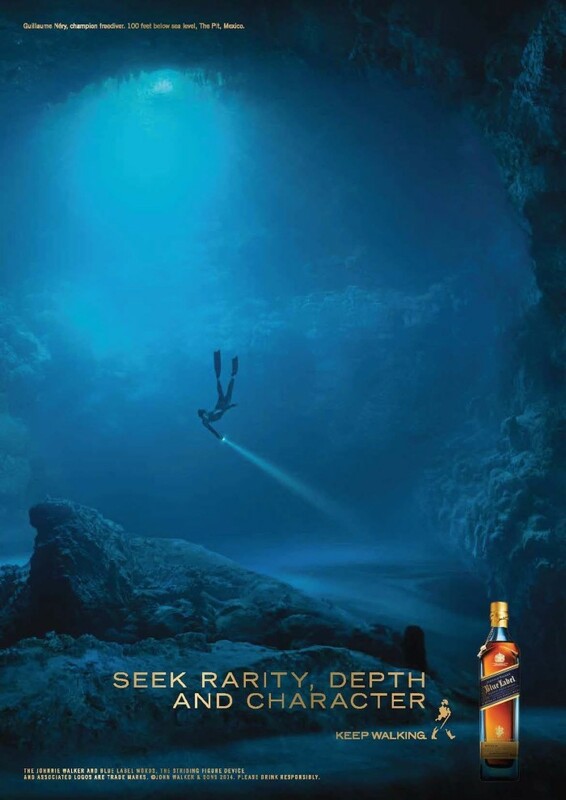 Johnnie Walker Blue Label – the expression of rarity, which is depicted by Guillaume Néry, the French world-champion free diver, who was photographed in search of rarity and depth some 100ft below sea level in The Pit, the entry point to the world’s largest underground river system in the Yucatán Peninsula of Mexico . Johnnie Walker Gold Label Reserved – is crafted by the company’s Master Blender using some of his favorite whiskies, including Clynelish Single Malt Whisky whose water source flows from the Kildonan Hills where gold was discovered in 1868, to produce a blend of great smoothness and radiance. 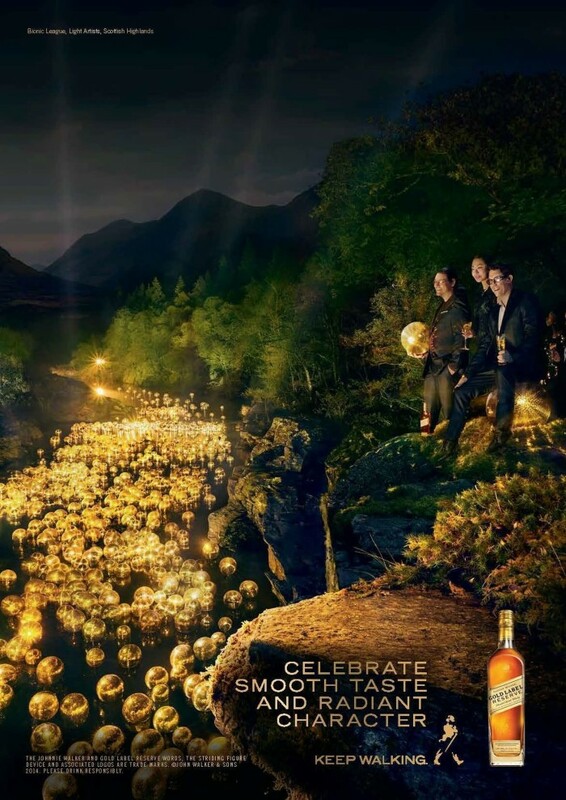 In the advertising, pioneering light artists Bionic League created a physical representation of this smoothness and radiance as they produced a literal ‘River of Gold’ by floating golden disco balls down a river in the Scottish Highlands. Johnnie Walker Black Label – a modern classic with a deeper and more intense character, derived from naturally smoky whiskies and the use of deep-charred barrels. In the advertising, the characters of both blends are brought to life by Italian-born artist Mattia Biagi who is known for transforming everyday objects into vibrant and iconic works of art in black. 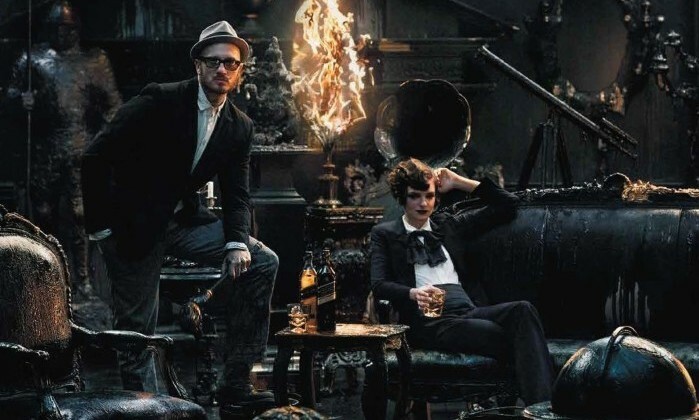 For the advertising campaign, he transformed a whole room of iconic luxury pieces – including a grand piano and a vintage car – into bold and intense pieces of art, through the use of black, fire and smoke. The Character campaign launch follows the brand’s recent release of the online film ‘The Gentleman’s Wager’ starring Jude Law and Giancarlo Giannini and the hugely successful ‘Symphony in Blue’ event – the world’s first theatrical, experiential, musical and artistic journey through a luxury whisky – held in London last month. IBM design and digital experts will work with clients to help engage customers using big data, mobile, cloud and social innovation.. 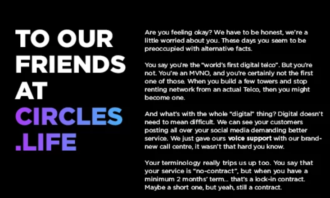 When the acquisition concludes, Livestream’s offering will be integrated with Vimeo's. ..
After eight years leading M&C Saatchi in Asia, CEO Chris Jaques is stepping down. ..